A Team of youth, who are passionate about social service and having compassion towards the sufferings of the disadvantaged sections of the society, joined together and formed Sai Educational Rural and Urban Development Society (SERUDS) in Kurnool Dist of Andhra Pradesh. It is a non-profit, voluntary organization working for an integrated development of women, children and other vulnerable segment of the society. SERUDS has been providing relief, rehabilitation, skills trainings, livelihood support to the deprived and disadvantaged sections of the society for their empowerment and dignified living. SERUDS have been providing midday meal to elderly persons, running crèche centres for care and support of deprived children, supporting for care and protection of orphan children, conducting awareness camps on health, education, environment, legal and social issues, etc. And also providing educational material and sponsoring school fees to the poor and deserving students. SERUDS is a nonprofit organization registered under the Societies Registration Act, XXXV of 2001 vide Registration No. 264/2003. It also registered under 12A & 80G of Income Tax (Exemption) Act. S.Siddique (16 years) belongs to Maddur Nagar of Kurnool Dist – Andhra Pradesh, India aged 16yrs was a student of X standard at Ramakrishna Vidyalam High School, Maddur Nagar, Kurnool. His father is a temporary car driver. He is not able to get regular work and the entire family depends on his irregular income. Though he is interested in studies, his father was not able to provide facilities his education. He was admitted in Ramakrishna Vidyalayam but not able to pay school fee and purchase necessary books and stationary. Knowing his interest in studies and poor financial situation, SERUDS sponsored S.Siddique under their child sponsorship program. Under this program he has been provided with school fee, educational material, school uniforms, etc. along with 10 other needy students studying in different schools. 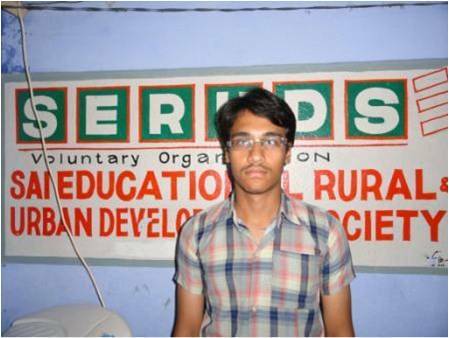 With this support provided by SERUDS, S.Siddique studied well and took SSC public examinations during March 2012. With his hard work and curiosity in studies he passed through the SSC public examination with 582 marks out of 600. The top score obtained by him has been acknowledged by the School authorities and the community. He elevated to the top position with sponsorship from SERUDS. S.Siddique says “my father is a car driver and not able to educate me. Am interested in studies, but my father asked me to learn driving by dropping from school. At that juncture, I knew through my friends that SERUDS is sponsoring poor students under educational program. I met President of SERUDS and after knowing my interest in studies, they have sponsored me Rs.800/- per month throughout the academic year. With this support and encouragement, I did hard work and scored 582 marks in SSC public examination. I desire to become software engineer. I recently joined for Intermediate with IIT coaching. I appeal for payment of fees and other expenses towards my education”.